Popular cosplayer and blogger, Chaka Cumberbatch. 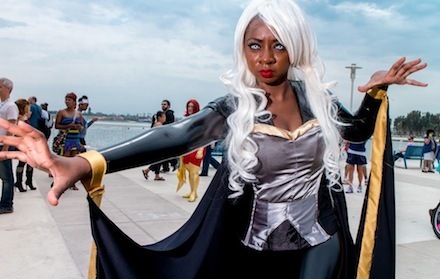 I read a brilliant – and heart-wrenching article today in which cosplayer, Chaka Cumberbatch demanded better representation for Black women characters in popular geek media, because frankly, the lack of a Black presence in fandom has her fatigued. “…faces like mine in my comics.” That was the beginning of my heartbreak for this brilliant sister truly believes those comics are hers. And they should be. They should be written with her – a serious and long-standing fan of comics and other forms of geek fandom – in mind; but they aren’t. They should feature more Black women – and men, for that matter – as superheroes because Black women are, well…extraordinary; but they don’t. Because mainstream geekdom is not concerned with us. A Black hero is “different”; is “risky”; and no form of media in the mainstream is in the business of taking risks. Those characters were not written with us in mind. Consciousness is the quality or state of being aware of an external object or something within oneself and we are acutely more aware of self than of anything external. So, to put it bluntly, we are not part of the consciousness of the creators of fandom, who are mainly white men…white men are. 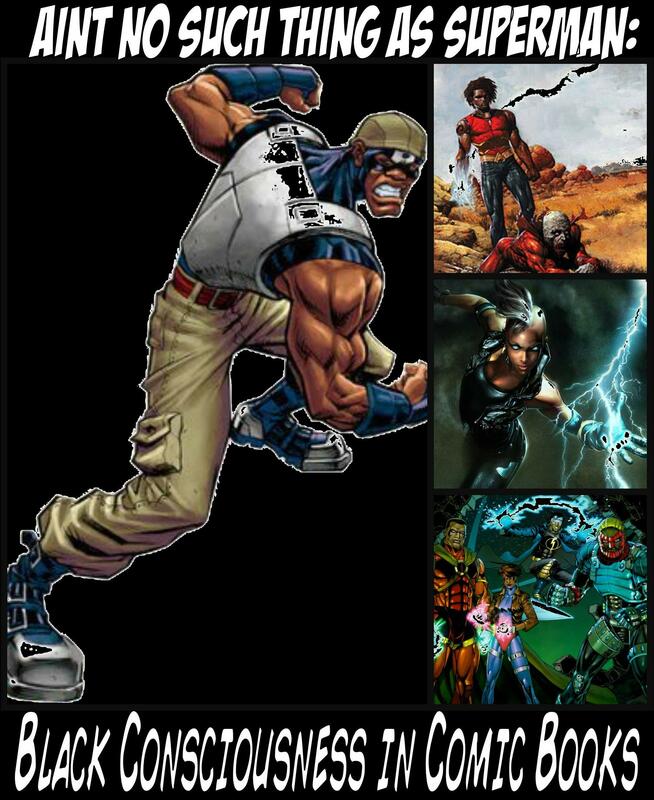 When these men write a Black character in a comic book, it is not to appease Black people; it is not to fill some status quo; we are not part of the conversation, contemplation or consciousness. We are the only people who believe that if we write about a Black hero or shero, they must have a white sidekick or mentor in order for the book to be accepted. We are the only people who cry “I live in a multicultural world, so I write what I see.” White people live in that same world. 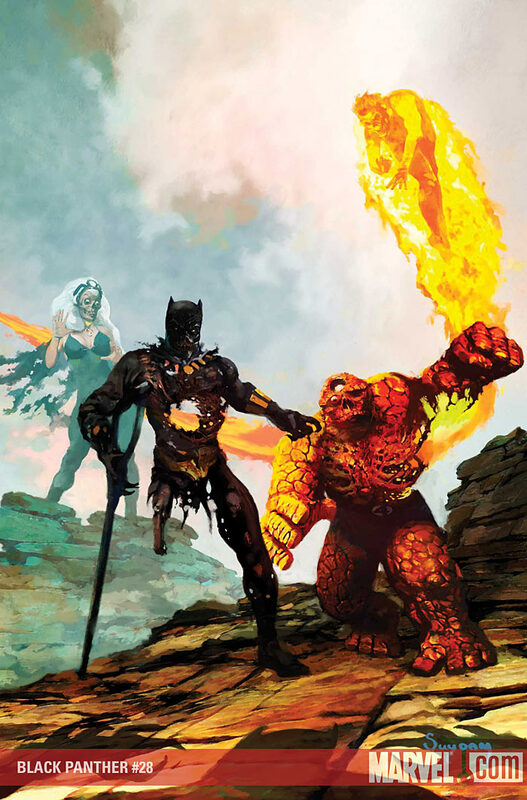 If they decide to write a multicultural tale, the hero is, more often than not, a white man. If they are “really hip”, they might have a white woman as the protagonist, but a person of color as the protagonist is a rarity, indeed. And we should not complain about that. People can write what they want to. We should not demand more representation from the mainstream. The mainstream does not care about the Black demographic at best and is a racist institution at worst. The institution of geek fandom is old and has been allowed to keep running with our support and our hope for a brighter and better day for women and people of color. However, this institutional racism within fandom will continue as a pattern of racial exclusion simply by virtue of folks doing things the way they have always been done. 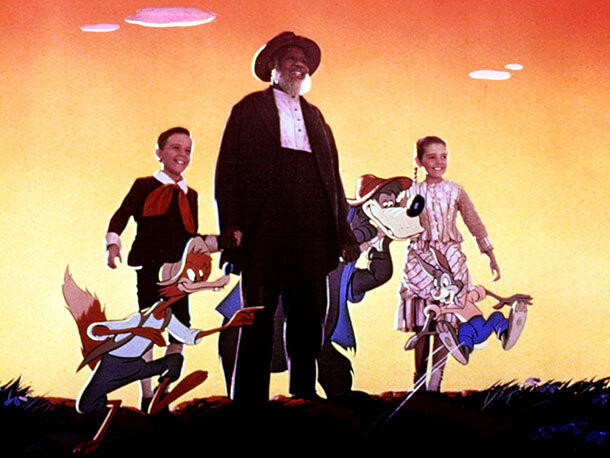 Recently, Worldcon – the biggest convention in fandom – planned to screen the spectacularly racist film, Song of the South. Yep; that Song of the South. When called out on this madness, Worldcon fans – mostly white men, of course, were swift to defend their beloved con. One fan summed up the sentiment of fans nicely: “Going to cons–and Worldcon moreso–is a luxury activity. The truth is that most POC don’t have the disposable income [to attend fan conventions]. They’re a noticeable minority at airports, on cruises, and other luxury activities”. I wonder if he received a free guest pass. See? We need to transfer out of the racist institution called mainstream geek media and enroll in a new institution; an institution of our creation. An institution in which Samuel Delaney is President; Octavia Butler and Charles R. Saunders are the Deans; Walter Mosley, Nisi Shawl, Steven Barnes and Tananarive Due are Department Heads; and Milton Davis, Nnedi Okorafor, Geoffrey Thorne, Valjeanne Jeffers and Balogun Ojetade are Professors; an institution in which veteran, up-and-coming and aspiring creators and fans of Black Speculative Fiction, Film and Art walk its hallowed halls. My dear sister, Chaka – and every other sister out there who feels marginalized and underrepresented, check out works by the aforementioned creators and you will have plenty powerful, beautiful and extraordinary Black sheroes to cosplay – from a Steamfunk Harriet Tubman to a spear-wielding demon-hunter whose sisters are a pair of lionesses and more. Keep this conversation going and join artist and Curator of OnyxCon, Joseph Wheeler III; comic book store owner, collector and publisher, Tony Cade; comic book author, collector and critic, Hannibal Tabu; and renowned comic book and animation creator and illustrator, Dawud Anyabwile, for Aint No Such Thing As Superman, a discussion on the influence of the conscious community on Black comic books and graphic novels and the impact of Black comic books and graphic novels on the conscious community. 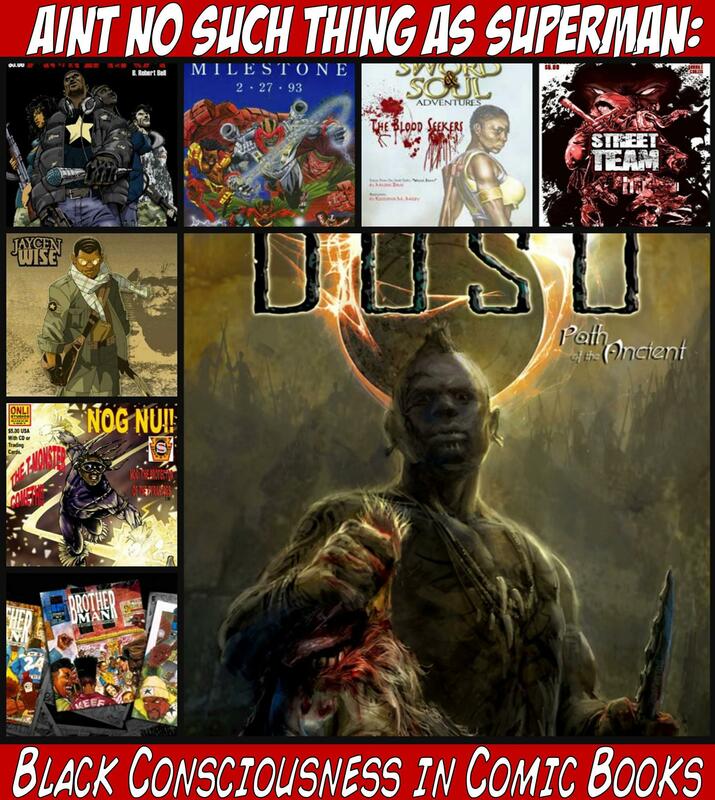 Posted by Balogun on October 8, 2013 in Afrofuturism, Dark Fantasy, Fantasy, Panel Discussion, Science Fiction, Speculative Fiction and tagged Black comic books, black cosplay, Black Speculative Fiction Month, cosplay. It’s certainly part of the problem, but there are also people working towards inclusion, and they’re the majority. Even the people planning the programming were working from an angle of showing what’s wrong with our past, not marginalizing, and when it was pointed out that they accomplished exactly what they wanted to condemn they backed off it immediately. I share your anger at that inane comment, but it’s the opinion of one person, not the convention at large. Thanks, for your reply Don! Factual correction: Worldcon did NOT screen Song of the South. When the intended screening was pointed out, the committee withdrew it, acknowledging that it had been an inappropriate choice. See http://www.lonestarcon3.org/program/animation.shtml for the convention’s statement at the time. Thanks, for the correction. Pablo Vasquez informed me as well. I am glad it was not! Thanks, so much, for your feedback, Pablo! After seeing this, I ran across this article in Ebony: http://www.ebony.com/entertainment-culture/terry-crews-talks-meatballs-and-superheroes-111#ixzz2hFW22nbL&g. I read that article, Cheryl. VERY interesting! I understand your call to create a new institution, but I hope that traditional fandom can change too. Just an FYI, in case you haven’t heard: Since the Worldcon will be in London, England next year, there will be a North American Science Fiction Convention (or NASFiC) and it will be held in Detroit, MI. We’re very excited to have Steven Barnes as our author Guest of Honor at Detcon1! We’re taking a very proactive approach to making the convention as inclusive as possible to all fans and are wrapping up the details on some initiatives we’ll be announcing soon. I hope we’ll see some of you there! detcon1.org has more details. Thank you for your feedback. 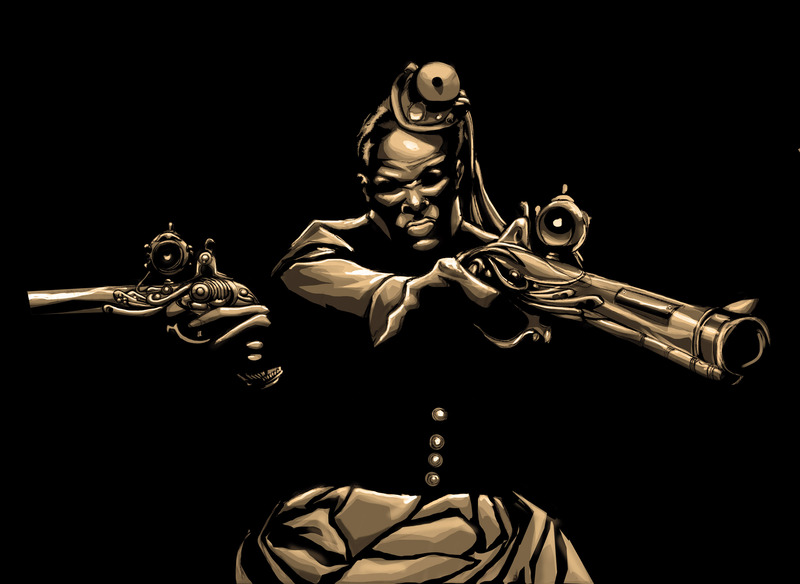 The Black Speculative movement is not new, but certainly needs to grow and is doing so – rapidly. “Traditional” fandom will change, too, as more people demand it. Definitely! We are excited to be the agents of the change we want to see and know needs to happen. Preach Brother Balogun! Love this article :)! Excellent article and I couldn’t agree more. As a Fiction author, graphic novel artist and geek film maker…I’m tired of hearing what I “should” create. I was not happy with what I was finding in steampunk fiction (for completely different reasons) and so I wrote what I wanted to read and hoped I would find like minds. The same goes for my graphic arts, short films and all the rest of my “non-professional” work. I “think” I am fairly embedded in geek fandom both as a fan and contributor, and I applaud anyone else’s efforts to bring THIER voice to the fandom….because I sure as h$ll won’t be their voice. I have my own agenda, likes, cultural goals and history and target audience. When I create non-white characters, empower them and populate my fictional worlds (or graphic representations of…) i don’t do it for multicultural brownie points and frankly i have little respect for those who JUST do so to show how liberally hip they are. If you the creator are motivated to tell a story from a specific cultural view, really motivated and not just putting coins in the PC box then YOU ROCK…assuming you can tell a good story. That means the character, comic, fiction, movie whatever is worth the time beyond what shade crayon you used. Personally I like to use the whole box, but that’s cause I like it. Admittedly, the peach crayon gets used up first though. Thanks, so much, for your feedback, Brian!